Manufacturing, Trading, Importer and Exporter of Boiler Components. We are fully equipped with machinery, dies and fixtures for fabrication of high pressure boiler components. 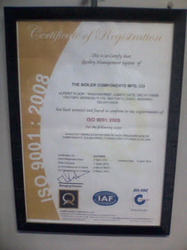 Our commitment to quality is backed by our dedicated experienced staff following national and international norms. All the products are manufactured strictly as per customer drawings and designs as per Indian Boiler Regulations or any other international standard. inspection from Boiler Inspectorate or any other 3rd inspecting party is accepted. Radiography of weld-joints, stress relieving, ovality and thinning is controlled as per the relevant codes. With our long experience, we maintain inventory of better quality of raw material. With our experienced staff and facility available with us, we continue developing new products so that our clients continue getting better stuff with ultimate efficiency. As a matter of fact, our customers are our GURUs in developing new and modified products to meet with their requirements. With the experience of almost 3 decades, we have been able to cater to the demands of various boiler houses of thermal power stations and captive power plants. Our extensive experience as well as technical expertise of our work force helps us to manufacture successfully a wide range of shaped tubes, Water wall tube panels, Economisers, Superheaters, Coils, Soot blowers , Steam piping and Pipe fittings as per international standards. We can also customize our Boiler components as per the specifications and Drawings provided by our esteemed clients. Prime quality and 3rd party certified raw material is used in fabrication of our products. Backed by long experience, the manufacturing of high pressure boiler components, we comprehend the diversified requirements of our client belonging to various industries. Our range includes tube economisers, boiler coils, forged steel globe valves, cast steel globe valves, double finned tubes, circular finned tubes, steam distribution headers, moisture separators etc. Fabrication as per developed drawings. National and International standards are opted for designing such custom-built components. With the satisfaction of our products, we could earn an excellent good will with our customers and continued patronage. Quality and timely delivery of the products could make our clients as regular. State Electricity Boards of Gujrat, Maharashtra, West Bengal, Delhi including NTPC. Refineries including Indian Oil Corporation,IBP Co.Ltd.,Hindustan Copper Ltd etc.etc. Steel Plants like Bokaro Steel Plant, Indian Iron & Steel & Co. Ltd. Mid-east Steel Co. Ltd. etc. etc. Cement Plants like ACC, Diamond, Satna, Ambuja, J.K,Vasavadatta etc. etc. Paper Mills like JK, NEPA,Ballarpur etc.etc. Chemicals & Fertilisers like NFL etc. Other captive plants of misc.industries.